Etcher, painter, teacher, writer and lecturer, Samuel Margolies, a native of Brooklyn, studied at the National Academy of Design, the Cooper Union Art School, and privately with Victor Semon Perard (1870-19570). 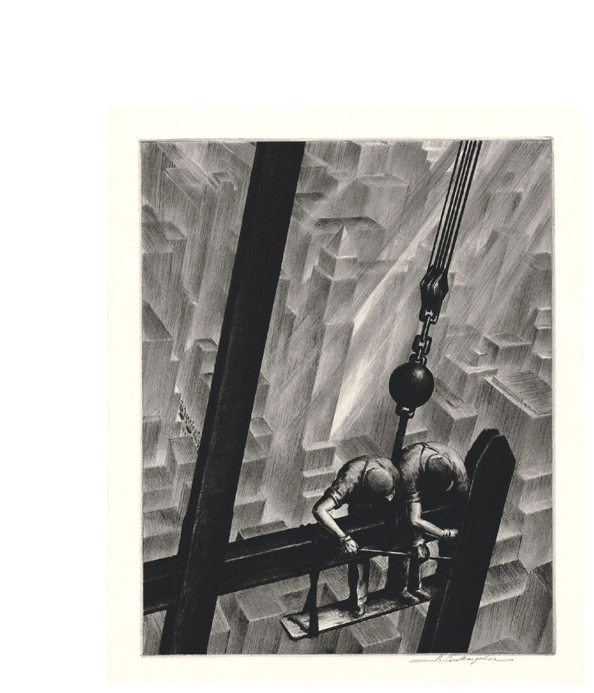 He also studied and exhibited at the Beaux-Arts Institute, a New York academy that attracted many immigrant and first-generation Americans aspiring to work in the construction design trades. 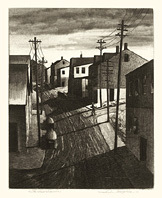 During the Great Depression of the 1930’s Margolies turned seriosly to the intaglio mediums, becoming a master of etching and aquatint techniques. His representational graphic work ranged from serene rural images of the New England countryside to his now renowned compositions of Manhattan's dramatic skyscraper canyons and high-rise construction workers. Margolies exhibited in numerous venues, mostly in New York, including the Society of Independent Artists, the Society of American Etchers, and the Whitney Museum of American Art. 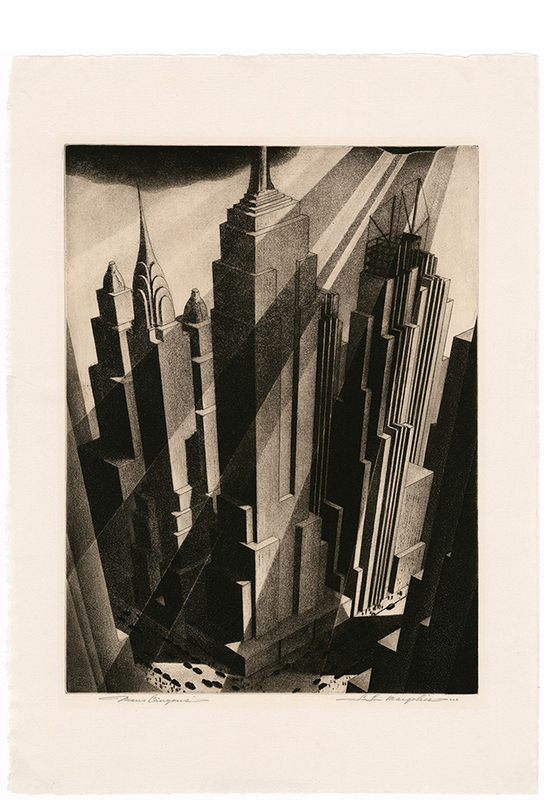 His prints reached a broad public through regular Associated American Artists’ publications. In 1935 Margolies joined the Federal Art Project of the Works Progress Administration (WPA), where he served as an instructor in its Art Teaching Division. 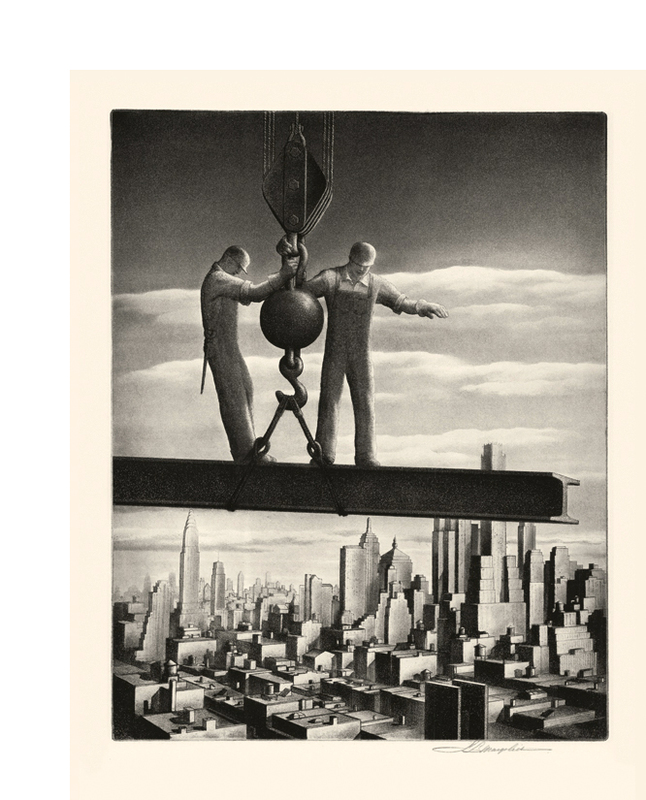 A member of the American Artists Congress, his etchings were displayed in the New York World's Fair in 1939. That same year he left the WPA to work as a circuit designer for the Bundy Corporation, continuing to work as an printmaker into the early 1940s. 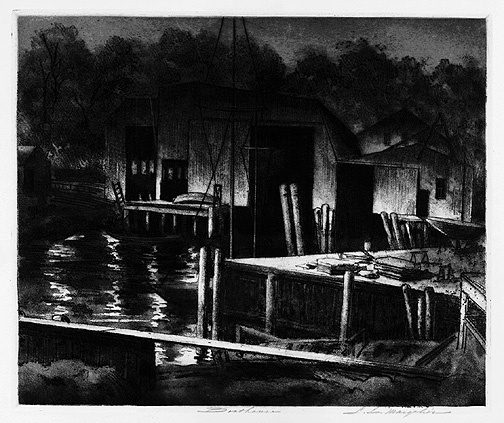 In the 1950s, he conducted classes in etching into the 1950s, but had ceased producing his own prints. The artist’s work is included in numerous collections including the Library of Congress, the Metropolitian Museum of Art, Georgia Museum of Art, Lowe Art Museum, and the Nelson-Atkins Museum. Man's Canyons = 1936, Etching and Aquatint. Edition 100. Signed and titled in pencil. Image size 11 13/16 x 8 3/4 inches (300 x 222 mm); sheet size 15 7/8 x 13 inches (403 x 330 mm). A fine, rich impression, on cream wove paper, with full margins (1 7/8 to 2 1/8 inches), in excellent condition. Reproduced: Pressed In Time: American Prints 1905-1950, Henry E. Huntington Library and Art Gallery, San Marino, 2007. 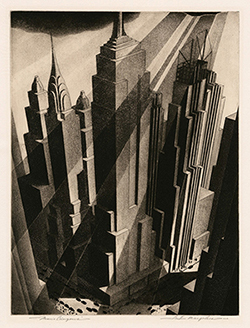 Exhibited: Pressed In Time: American Prints 1905-1950, The Huntington Library and Art Gallery, San Marino, 2007-2008. 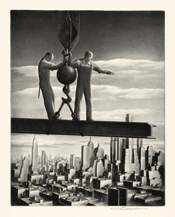 Builders Of Babylon = 1937, Aquatint. Edition 250. Signed and titled in pencil. A brilliant, richly-inked impression, on cream wove paper, with full margins (1 to 2 inches), in excellent condition. Published by Associated American Artists, with the original AAA mat and label. Reproduced: Graphic Excursions, American Prints in Black and White, 1900-1950, Selections from the Collection of Reba and Dave Williams, David R. Godine, 1991. Collections: Elliot Museum (Florida), Hood Museum (Dartmouth), Metropolitan Museum of Art, Syracuse University Art Gallery. 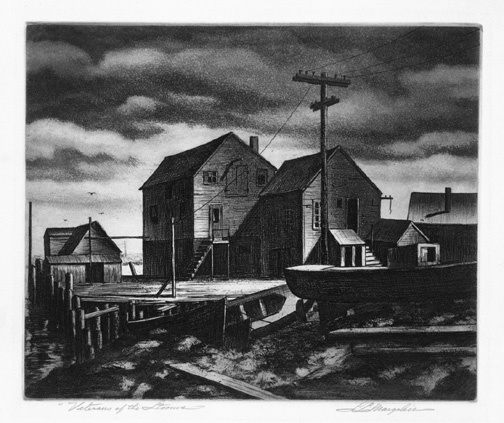 Veterans of the Storms = c.1937, Etching and Aquatint. Image size 8 1/4 x 9 15/16 inches (209 x 257 mm); sheet size 11 1/16 x 13 3/8 inches (281 x 340 mm). A fine, rich impression, on off white wove paper, with full margins (1 1/16 to 1 11/16 inches), in excellent condition. 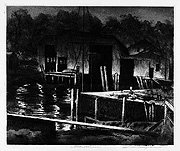 Boathouse = c.1937, Etching and Aquatint. Edition c. 25, FAP NYC WPA. Signed and titled in pencil. Image size 9 5/8 x 11 1/2 inches (245 x 292 mm); sheet size 11 1/2 x 15 7/8 inches (292 x 403 mm). A superb impression, on buff wove paper, with full margins (5/8 to 2 2/8 inches), in excellent condition. 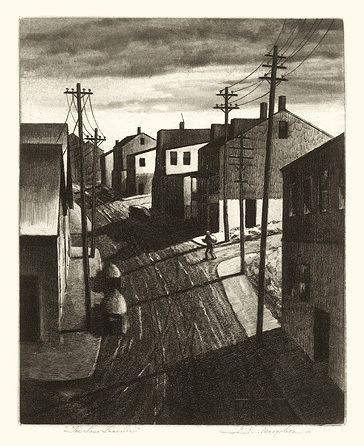 The Lone Traveler = c.1937, Etching and Aquatint. Image size 9 5/8 x 7 5/8 inches (245 x 194 mm); sheet size 11 1/2 x 9 inches (292 x 229 mm). A fine, rich impression, in dark brown ink, on cream wove paper, with margins (9/16 to 1 inch), in excellent condition. Men of Steel = 1941, Drypoint. Image size 14 7/8 x 11 3/4 inches (378 x 298 mm); sheet size 16 3/4 x 13 1/2 inches (425 x 343 mm). A superb, richly inked impression, in warm black ink, with full margins (1 1/8 to 1 7/8 inches), on off-white wove paper; in excellent condition. Published by Associated American Artists. Reproduced: Graphic Excursions, American Prints in Black and White, 1900-1950, Godine,1991; L’Amérique de la Dépression: Artistes Engagés des Années 30 (cover), Musée-Gallerie de la Seita, Paris, 1996; Pressed In Time: American Prints 1905-1950, Henry E. Huntington Library and Art Gallery, San Marino, 2007. 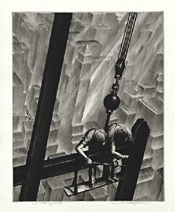 Exhibited: L’Amérique de la Dépression: Artistes Engagés des Années 30, Musée-Galerie de la Seita, Paris, 1996-97; Pressed In Time: American Prints 1905-1950, The Huntington Library and Art Gallery, San Marino, 2007-2008. Collections: Crystal Bridges Museum, Metropolitan Museum of Art.